I know, I know. I have no right to complain. I live in an area of California where you can pretty much wear a long sleeve sweater all winter long and never get too terribly chilly. But ... it's cold today! In my apartment, anyway. It might be warmer outside than it is in here. I closed off the rooms I'm not using, turned on the expensive wall heater, and I have a heating pad on my back and a cat on my feet, but dang it's cold. Brrrr. Wow, you can really see how uneven my stitches are in this pic. Shouldn't I be better by now? I'm going to blame it on poor lighting. Now that I've complained about the chill, I'll admit it does make me want to sit and knit. 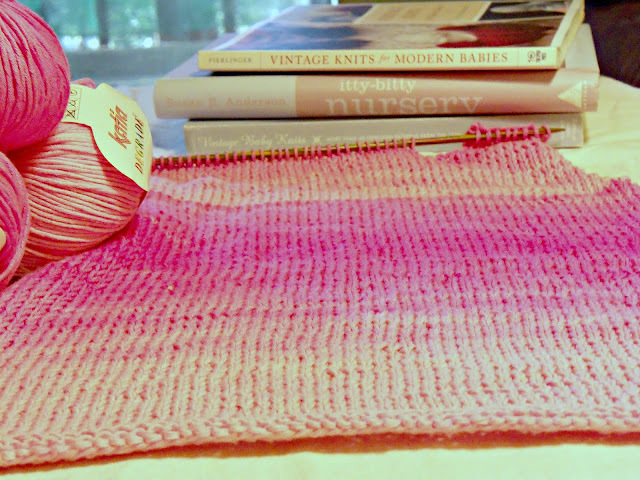 I'm making good progress on the pink apron dress, which I'm knitting with Katia Degrade. I love the long color segments and gradation of tone. The abrupt change from dark to light at the top is where I added a new ball. The contrast is intentional. Would you like to win an iPad Mini? I sure would. Cooperative Press, a publisher of knitting books (and other types of books), is giving one away along with several other prizes﻿. You can find out more about the contest HERE. If you are having trouble uploading photos in your Blogger, I found a workaround by clicking on the HTML tab while composing the blog post. It is located just above the box where you enter the post text. There are two tabs-- one says "Compose" and the other says "HTML." If you click on HTML you will see your post in HTML code, but you can then click on the image icon and upload a photo from your computer. Then you can click on "Compose" and finish writing it without viewing the HTML. Hope you are enjoying your Sunday. Have a great week! I'm off to make deviled eggs and maybe turn up that wall heater. Downton Abbey tonight. Woo hoo! Ha, and I want the cold since we were 80 degrees today! Send it my way please. Thanks for the giveaway link, I will have to check it out. Thanks for the picture tip. I was having issues. Love the colors in your yarn. Thanks for the picture info. I was having trouble too and getting tired of blogging from my phone! Love the shades of pink! I love sitting in my chair with a heating pad on my back:) It is colder inside than outside here in my little home! Have a blessed day, love the colors on your apron dress! HUGS! I love the pink. Makes me want to get started on a sweet little sweater for my nephew who is due this year. That yarn is lovely, I can't wait to see your apron dress finished! 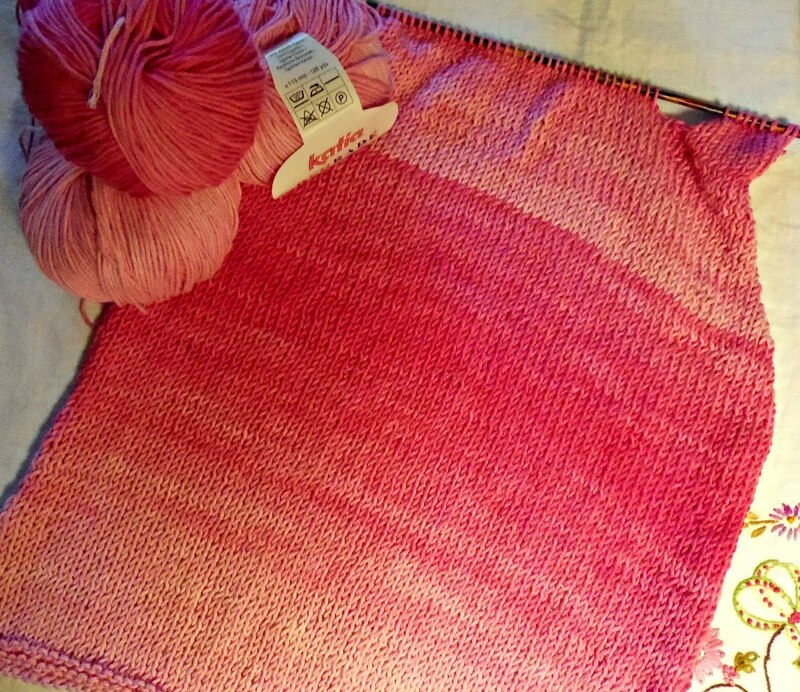 I think your stitches are beautiful - I can't wait to see your finished knitting. Hope you 're warming up! I have to chuckle at your idea of cold. Next week we will be having HIGHS in the single digits. Even a winter-lover like me finds that daunting! It's Official: Knits for Weddings Are In!